Garmin have announced the Descent Mk1, a dive computer offering surface GPS positioning with rich colour mapping. It's designed for recreational, technical and freedivers, as well as being attractive enough to wear everyday, you know, when you're not diving. The Descent Mk1 is packed full of technical features, including the ability to automatically mark dive entry and exit points with GPS, as well as the ability to record depth, dive time, temperature, NDL/TTS, ascent/descent rates, gas mix, PO2, N2 loading, decompression/safety stop information, and time-of-day. You can cycle through these data pages with a push of a button or a double tap on the screen. 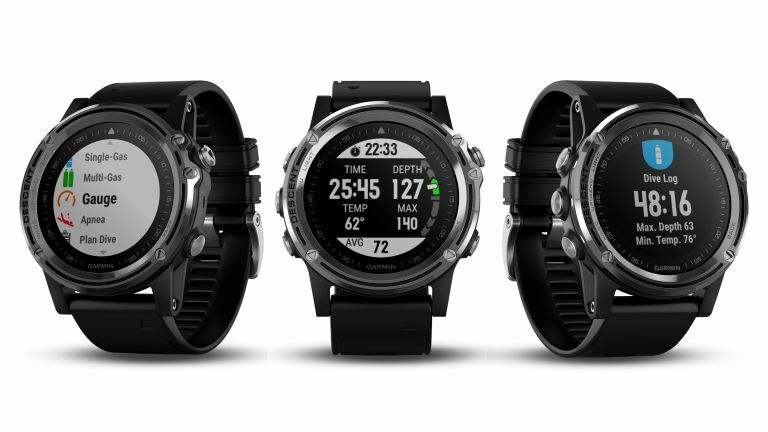 The Descent Mk1 also includes an Apnea mode for recreational and competitive free divers, and Apnea Hunt mode for spear fishers, as well as a heart-rate sensor. Once your dive is complete, the Descent Mk1 will automatically upload your dive logs to Garmin Connect for post-dive analysis. It really sounds like the ultimate tool for divers. In addition to diving, the Decent Mk1 also offers a range of multi-sport tracking (like those found on Garmin's Fenix watches), including running, biking, skiing, paddle boarding, and many, many more. If that's not enough functionality for you, greedy, the piece also pairs with your smartphone and displays messages, phone calls, and emails. The Decent Mk1 is available in two styles, a stainless-steel bezel with silicone watch band or a titanium bezel and brushed DLC titanium bracelet. The bands can be quickly swapped between regular length and longer bands, for use over thick wetsuits. Using QuickFit™ bands, the diver can easily change between regular and longer bands, for use over thick wetsuits or dry suits. The dive watch is rated for dives of up to 100 meters (at EN13319 standard), and will last up to 40 hours in dive mode or 21 days in watch mode. The Descent Mk1 is expected to be available in Q4 2017, with an RRP of £999 (around $999 USD) for the stainless-steel model, or £1299 (around $1299 USD) for the premium titanium version.